Unless you're going for an all-natural, Bear Grylls-type vibe, being a functioning human in the world requires things along the lines of washing your hair and not showing up to work looking like you were an extra in The Revenant. In general, staying clean and smelling like an alpine mist are good things. The problem is that many Americans have become hyper-obsessed with cleanliness and germs, without totally understanding the implications. Taking your hygiene a little too seriously can actually be harmful, not to mention expensive -- these "necessities" pad Americans' toiletry bills each month, even though they're more of a (potentially) harmful luxury than a necessity. Stepping into a hot, steamy shower every day isn't just comforting -- it also seems like the proper adult thing to do, assuming you're lucky enough to have a job. No one wants to be the smelly person in the office, and washing away the dirt and grime you've accumulated seems like a common-sense way to stay healthy. But Americans are sudsing up way too much. Compared to other well-off countries, people in the US admit to showering an average of around seven times a week -- like, every freaking day, sheesh -- which is more than the five times a week for people in China, Britain, and Japan. And while French and Spanish people shower around the same number of times as Americans, they shampoo much less frequently -- the French, for example, shampoo just twice per week. All that bathing isn't just excessive compared to other developed nations; it can end up being worse for your skin and hair. "Daily washing is not necessary for most people," dermatologist Dr. Tsippora Shainhouse says. "It washes off natural oils, and leaves skin dry and at risk for irritation." She recommends showering every other day. "This will help to rinse off dead skin cells and grease, as well as superficial bacteria and yeasts, which can lead to body odor, acne-type flares, and rashes in some people," she adds. You only need to shower more frequently if you work a physically strenuous job, or exercise for an hour every day. And if you're using antibacterial body washes, you're washing away all the good bacteria you want on your skin. Skin bacteria have been compared to gut bacteria, in that there needs to be enough of the good stuff to thrive and naturally fight off the bad kinds of bacteria. In fact, research from the University of Utah suggests that most Westerners royally screw up their microbiomes with too much showering. After hopping out of the shower, Americans love to cover their armpits with deodorant and antiperspirant. If those painfully awkward health classes on puberty taught people anything, it's that deodorant is an essential part of an everyday hygienic routine. No one wants to be stinky! But the desire to get rid of natural -- sometimes gross! -- scents usually means rubbing aluminum right onto your underarm. Research suggests that antiperspirants containing aluminum may cause gene instability in breast tissue, not to mention the neurotoxic effects associated with the metal generally. Parabens and phthalates, chemical ingredients both frequently found in deodorant, can also disrupt your hormones, especially when applied to such a sensitive area. Basically, it's better to be the smelly kid, though you can class it up by saying it's "the European way." Brushing your teeth twice a day is also something that's been ingrained in you since preschool, and it's still a good rule of thumb to live by. But to avoid those Brexit-friendly teeth, some people think brushing more frequently must be better. Not always. If you whip out your toothbrush and toothpaste after each meal and snack, especially if it's something particularly acidic (coffee, pickles, citrus fruits, etc. ), it can cause more damage. Acid naturally erodes enamel, and brushing can push the acid further into your teeth. It’s best to stick to the twice-a-day rule -- three times if you eat something particularly gnarly -- just make sure you don't hit the toothbrush to your teeth until about an hour after eating. While you're cleaning yourself, you end up using tons of products that you may not really need in the first place: body wash, face wash, shampoo, and conditioner. Then, the containers are tossed (hopefully in the recycling bin!) -- you're literally washing your hard-earned money down the drain. Body and face soap is a $3.1 billion industry annually, according to Nielsen, and the US Census Bureau reports people spend $4.3 billion on shampoo a year. So why do people feel the need to maintain an obsessive hygiene routine and spend tons of money on fancy products when they feel the slightest bit dirty? It's the same reason sugary cereals feature kid-friendly cartoon characters, and the tobacco industry continued to thrive well after it was considered a carcinogen -- marketing. The same can also be said for hand sanitizer, which promises to zap all those nasty, disease-causing germs people had never really worried about until the last 20 years or so. Since it became a soccer-mom staple in the late-'90s, hand sanitizer sales have shot up to $118 million a year, according to Nielsen. It makes sense: parents are obsessed with dousing their hands in it, lest they catch something grimy from the human petri dishes known in some circles as "children." Hospital workers are even in on the action, smearing the germ-killing stuff all over their hands and arms whenever they get a free moment. The issue here is that while medical workers routinely come in contact with infectious diseases and contagious viruses, the average person doesn't. In fact, a few germs on your hands can be a good thing. 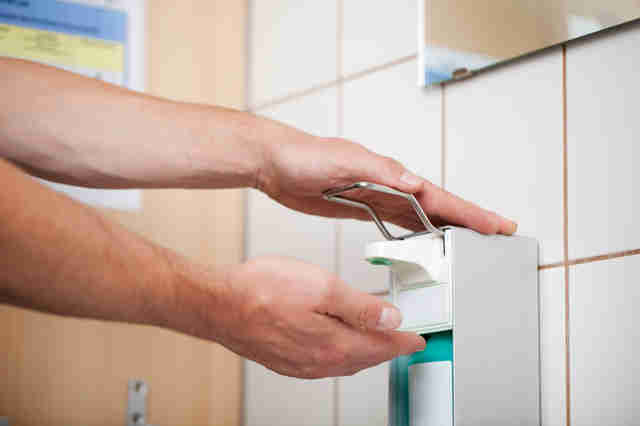 Hand sanitizer that kills 99.9% of germs is also killing the good germs -- remember those from your shower? -- that help build up your immune system. Without them, people end up contracting things like the highly infectious norovirus, and more super viruses can adapt and spread as we become less able to fight them off naturally. Just like hand sanitizer kills off germs on your hands, disinfecting wipes promise to do the same for your kitchen. Those convenient wet disinfecting wipes just seem much easier than regular spray cleaner and paper towels to wipe down surfaces. Some claim to "kill 99.9% of germs," which sounds like a good thing... but the hygiene hypothesis suggests otherwise. Once again, those beneficial bacteria allow your natural immune system to build up its strength. Besides, disinfectant cleaner is usually unnecessary for everyday cleaning, according to the Environmental Working Group, and could trigger asthma and other allergies. The only times you really need a disinfectant are when handling raw meat, or if a sick family member is coughing and sneezing all over the place, in which case they probably should be out of the kitchen anyway. Go for something that doesn't rely on antibacterials (even warm soapy water will do). Plus, it literally takes 10 extra seconds to wipe down your countertop, so in buying the wipes, you're just shelling out money for marginal time savings. Look, bathing and taking care of yourself are still pretty important. After a particularly sweaty workout, or muggy summer day, cleaning yourself up is just the polite thing to do -- especially if you're usually in close quarters with other people. But if someone tries to shame you for skipping a shower, or you don't douse your hands in hand sanitizer every time you venture out in public, don't worry. A little extra dirt and bacteria does a body, and your wallet, some good. Christina Stiehl is a Health and fitness staff writer for Thrillist. Dry shampoo is her saving grace. Follow her on Twitter: @ChristinaStiehl.